A brutal week getting back on my feet (pun intended) after a weekend of paddling. The day we left our peaceful island I was scheduled to run 4 miles. We arrived home around 7p and it was HOT…out the door and to the trails I went. Approximately halfway through my loop, I began experiencing severe abdominal pain. Most of the time I run though the pain, knowing it will subside. This time the pain was so severe it stopped me mid-stride. I waited a moment, took a sip of water then began to run again. Pain, Stabbing. Pain. Push through it, I told myself. Learn to feel the pain, its likely you’ll be feeling this again and again. Jinx. I trudged along another quarter-mile maybe when it hit me. Gastro-distress. Yep. Thank you fallen leaves. 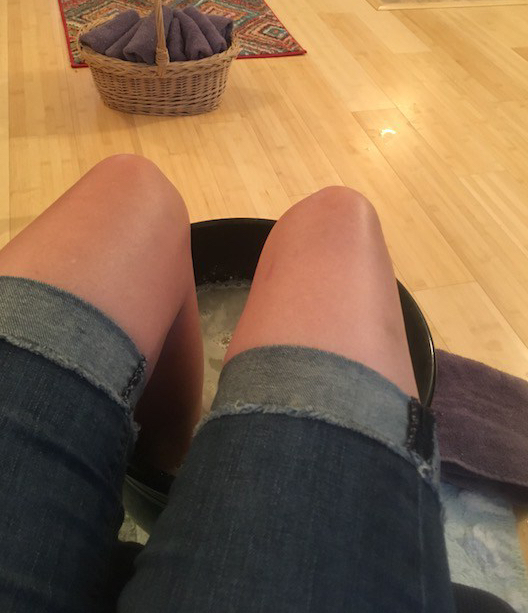 To round it all out, the week ended on a lovely note…a massaging clay foot bath. Disclaimer- technically 7 miles of the run total was a stroll in the woods…in the middle of the night (more on this to follow). I was still feeling pretty low from the prior week and needed a confidence boost. I was performing better, but mentally just not there. This weeks Kale training had me sprinting up and down an old woods road practicing form, carrying a Bulgarian bag up the trail and push ups in random spots along the trail (park bench, picnic table). During the workout he asked if I had planned out the next days long run; he had an idea. One of his friends had a bet going with another friend that he could run 100 miles and this friend could use a pacer/company during the overnight hours. My ultra is at night, thus a perfect training opportunity! Not to mention that it would get me into the thick of it, running along side an ultra runner. Insights on what to do, not to do and yikes, what was I getting myself into! My “session” started around 9:30pm and two laps (8 miles or so) later, things started to dramatically slow down. (John joined in at this point.) Fast walking, light running, slow walking, then sauntering, then waddling. Midnight came and went. We told jokes, sang songs (some major ear-worms), wondered what we were doing in the woods in the middle of the night, heard coyote and saw many frogs leaping for their lives. The runners mental state was all there, he was joking and singing with us, having a grand ol time. Hunger set in and no bar or gel was going to stave this hunger. Pizza and potato chips were tested…not so kind to the digestive system. Electrolytes helped a bit, but the sugar was making him feel…meh. It was coming on 3am Sunday morning and we were all tired. Not as tired as he, I am sure. I made a mental note that as long as he was moving and going to attempt this feat, I would stay out with him. What started out as a decent group of people (maybe 15), dwindled to four (not including the runner). The time was 4am and the runner was fading. He said he was all there mentally, but physically did not have it in him to continue on. At this point he had just about a marathons distance to go (+/- 26 miles) and he knew the limits of his body. It was not going to happen. Kale, John and I ran ahead to the trailer where his wife was waiting. Kale explained the circumstance and we all tried to rally for him, provide encouragement. I could see it in his eyes, he was DONE. The the time was 4:30am and he had completed 76 miles. So friggen close, so friggen inspiring! He hugged and thanked us for sticking by him though the night. I thanked him for allowing me to walk alongside him on his journey. I had learned so much. Wet day at the track…there were a few thunder boomers too! Can’t. Even. Fathom. You’re amazing! Thanks Luann….I think ha ha!